West Ottawa has several gifted student athletes. Some play a sport in college, and some receive a full-ride scholarship for academics. Some earn both options. Get to know Derek Maas. Maas is the third of four children in his family. His older siblings have already gone on to swim in college. Jenna Maas graduated from West Ottawa last year and swims at Oakland University. Kyle Maas graduated from West Ottawa three years ago and swims at the University of Alabama. Maas is basically a college student walking on a high school campus. West Ottawa must recognize his academic and athletic accomplishments throughout his high school career. High school students feel accomplished by receiving some college credit in high school. For Maas, college credits came easily. After the current school year, Maas will have 89 credits at Alabama even though the maximum Alabama recognizes is 60. To graduate at Alabama from Pre-medical, a student needs 120 credits. So, by having the maximum of 60 college credits as a high school student, Maas is basically a junior in college as a senior in high school. Maas has also taken 15 Advanced Placement (AP) classes and will have taken 19 AP exams after this year. For example, AP Chemistry, AP Biology, and AP Physics are some of the AP classes Maas has taken. Most students at West Ottawa take less than 6 AP classes. Let alone, the 15 that Maas has taken. Taking 15 AP classes throughout high school is incredible, but Grade Point Average (GPA) is important too. Maas has a 4.6 weighted GPA and a 3.96 unweighted GPA. An A- in 4th grade while taking Algebra 2 averts Maas from having a 4.0. “I was kind of sad about the A-, but I realized I was in 4th grade so I became less frustrated,” Maas said. Algebra 2 is a class meant for juniors in high school! Yet, Maas’ only A- occurred in Algebra 2 as a 4th grader. Maas’ SAT and ACT scores are phenomenal as well. On the ACT, Maas scored a perfect 36. According to Prep Scholar, 0.195 percent of all students who take the ACT score a perfect 36. Maas is one of the few to do so. For those unaware, Maas missed at most two questions on the entire gruesome, three hour standardized test. To prove that his 36 was no fluke, his SAT score is 1590. Maas felt like he got rigged on the SAT because he got one question wrong. Though he got one question wrong, his performance disappointed him. Maas took nearly 20 AP exams, his weighted GPA is 4.6, he got one question wrong on the SAT, and he got a perfect score on the ACT. Derek Maas defines a pure student-athlete. 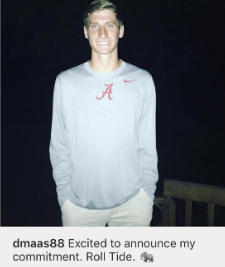 On October 3, 2018, Derek Maas commits to the University of Alabama. “I chose Alabama because of the great coaching staff and swimmers, as well as the great academic opportunities,” Maas said. Mass now joins his brother Kyle on the 11th ranked Crimson Tide swim team. Last season, Maas had a remarkable performance at the Division I state swim meet. Maas won the state title for the 100 yard backstroke and the 200 yard medley relay. In the 100 yard backstroke, he finished with a time of 50.23 seconds, beating out his competition by a full second. Maas continued his individual success in the 200 yard individual medley (IM). Maas lost a heartbreaker by finishing with a time of 1:50.32 and losing to the state champion by a half a second. He placed third, losing to two seniors. Even though he did not win the IM last season, a swim ranking website, Prep Scholar, predicts Maas to win the event this season. Not to mention, his times are fast enough to compete at Alabama right now. For example, with his time from last year’s state meet, Maas would have the third fastest IM time on Alabama. Consider this, his time from when he was a junior in high school would make him the third fastest 200 yard IM swimmer on Alabama! Alabama ranks as the 11th best team in the nation, so to be one of the top swimmers on the team is impressive enough. But, to have one of the fastest times on the team as a junior in high school is unbelievable. Sports fans love seeing great athletes express their humbleness. Maas credits his teammates for pushing him to be his best. “Regarding swimming there is no way I could have gotten to where I am without my teammates because I have done a lot of practices in my life by myself as well as with teammates so I know that it’s basically impossible to push yourself on your own compared to being on a team,” Maas said. The competitive nature of sports pushes others to be the best. The same is true for swimming. A simple glance at the swimmer next to you can force someone to kick harder, move their arms faster, or make their strides longer. As Maas said, teammates make athletes better, and without some of Maas’ teammates, he may not be the same swimmer he is today. Having the success he has had in both the classroom and the pool is not a simple task. Maas’ time management skills prove to be superior. He also has advice for those who believe it is too hard to be good in both the classroom and a sport; “One thing that has helped me in the classroom regarding time management is focusing on understanding instead of getting work done.” Maas said focusing on understanding the content in class has helped him spend enough time on school while remaining an excellent swimmer. For those who think it is too hard or too much work, look what Maas does. Maas excels in both the classroom and the pool which is why he demonstrates time management efficiently. Derek Maas has some remarkable accomplishments both in school and swimming. He is a one of a kind student that should receive higher praise. He inspires many and will continue his greatness in future years at Alabama!